Difference between Portal Method and Cantilever Method in Structural Analysis. 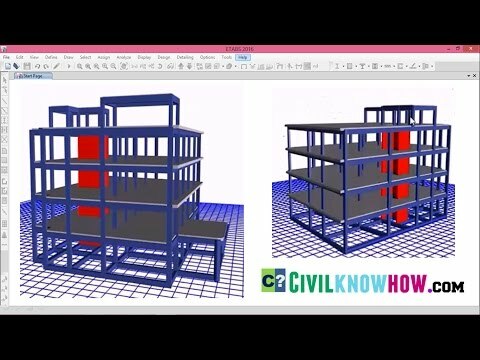 Etabs 2015 tutorial 5 deals with the reinforcement detailing of beams and columns of the model considered using the structural detailing option. Tutorial starts with the selection of a beam and its adjacent columns for reinforcement detailing. Parameters for design component preferences are entered for both beams and columns. 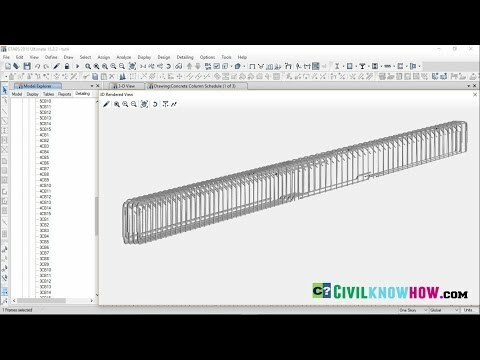 Tutorial then explains the rebar selection for longitudinal bars and stirrups in the case of beams. In the case of columns, rebar selection for both main and lateral ties are considered. After the structural detailing , tutorial deals with co-relating detailing results with the beam and column names. 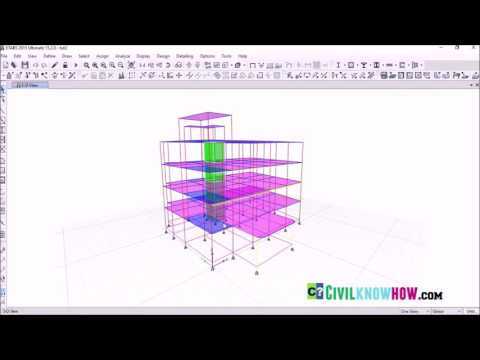 3-D rendering of the reinforcement in beam and column sections are explained at the end. 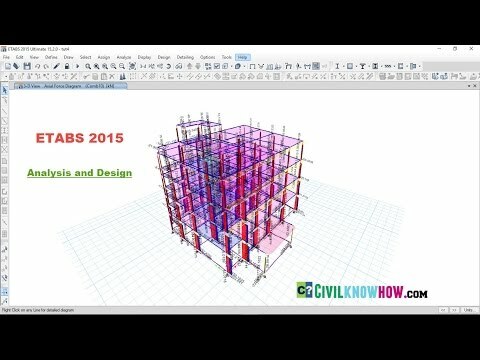 Etabs 2015 tutorial 4 deals with the analysis and design of the commercial building model. In analysis, tutorial explains about the model check that the model has to undergo before the analysis to make sure that the model is free from errors. In time period,steps to find the find the time period of the model for each mode cases are explained. In support reactions,tutorial explains how to find the support reaction values under the points where the support are assigned.The support reactions are used in design of foundation. Under frame reactions ,the steps are discussed to display the shear force and bending moments of the beam elements of the model.This section also explains how to find axial forces for the columns. In Design,the steps required to generate design reports are for each section elements in Etabs 2015 are explained. Etabs 2015 tutorial 3 deals with the assigning of seismic loads and defining load combinations. In assigning seismic loads, tutorial explains about defining seismic loads or base shear along both directions of the building and also defining the lateral load by selecting the desired international code in Etabs 2015. It is followed by mass source definition were the desired load pattern to take part in seismic analysis is defined. Under load combinations, tutorial explains how to define a load combination in Etabs 2015 and also how to define a combination as envelope to obtain maximum and minimum results from the selected combinations. 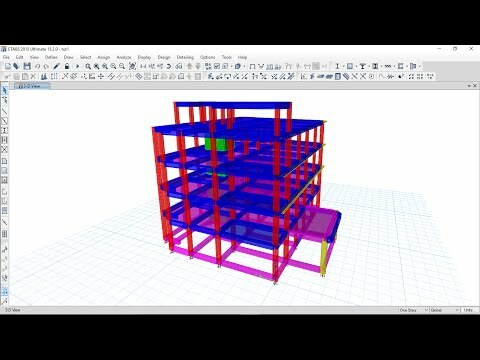 The second tutorial of Etabs 2015 deals with assignment of loads and meshing of slab of a commercial building.The first part discusses about defining and assigning of dead,live and wall loads. 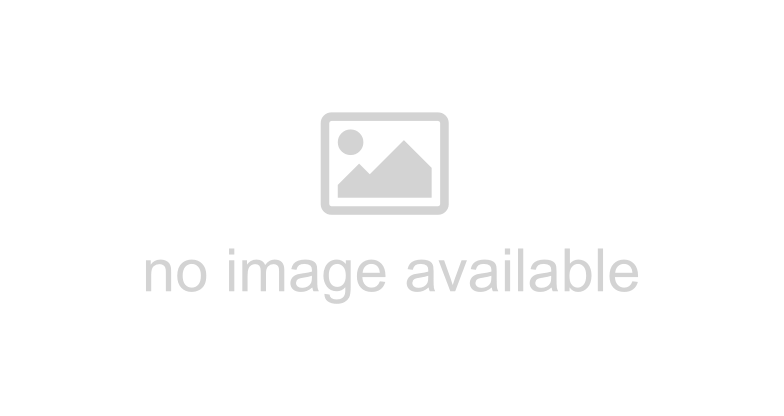 It is followed by procedure of meshing the etabs model by both manual and automatic methods. Step by step illustration on how to model a commercial building in Etabs 2015 building software.The tutorial is divided into seven different steps that starts from assigning grid data to model rendering. What is shear or shear force? The force which tends to make the top and bottom flanges or fibres of a beam move parallel to one another. The web of the beam resists the shear force, which is at its greatest at the ends of the beam next to where it rests on its supports. Eccentric load is a load on a column applied at a point away from the column center and therefore putting a bending movement on the column equal in amount to the load multiplied by the arm.